About two months ago, I started researching for the best Mexican cookbook to help me on my journey to perfect Mexican cooking. My buddy Drew introduced me to Chef Rick Bayless and his cookbook, Authentic Mexican: Regional Cooking from the Heart of Mexico. At first, I was a little hesitant and unsure about picking up a Mexican cookbook written by someone who is not Mexican, but after reading the first few pages of the cookbook the stories of his tour around different regions of Mexico to find the most authentic recipes reeled me in and Damn, son!…. I’m hooked. 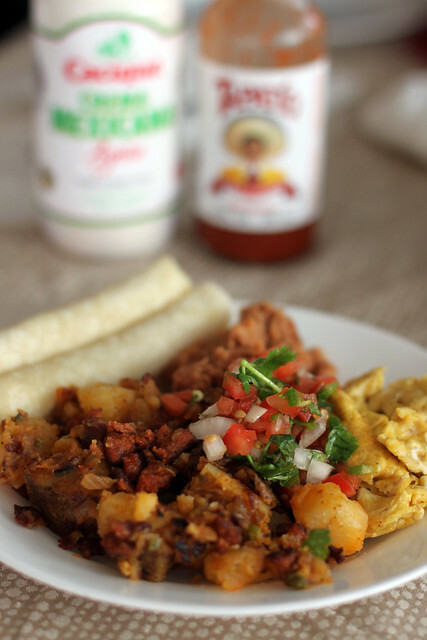 Papas y Chorizo recipe, which translates to Potatoes with Mexican Sausage, came from this cookbook and is something pretty easy to make and so darn delicious. 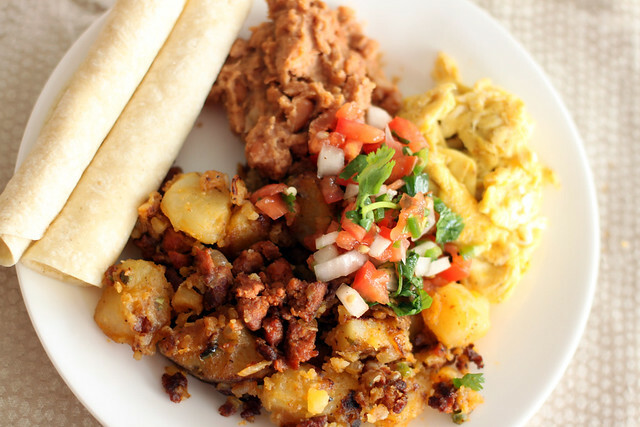 For this recipe, instead of buying the pre-packaged Chorizo like I used in my Mexican Chorizo Omlette recipe , I bought fresh chorizo from the Supermarket deli. I am glad I made that decision. 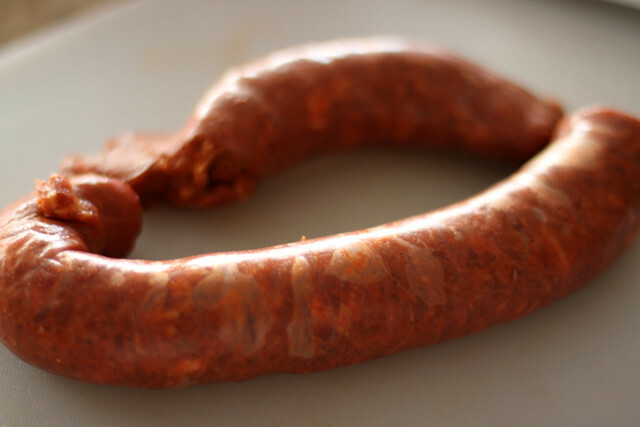 The deli Chorizo was cheaper than the prepackaged chorizo, meatier like Italian sausage when removed from the casing, and was packed with so much more fragrant spices and herbaceous flavors. YUM! After indulging in this fatty and flavorful goodness, be prepared to be full for the rest of the day. 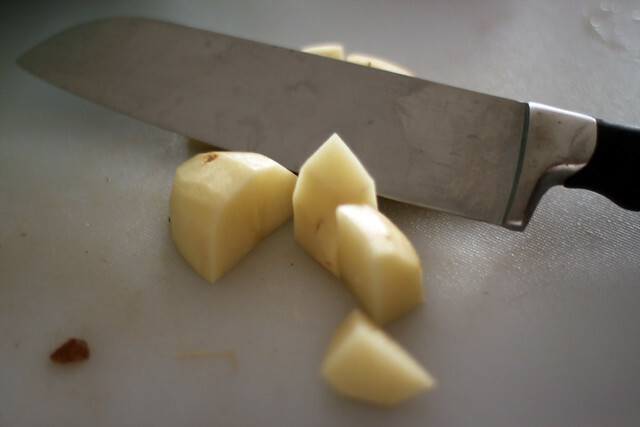 Dice potatoes in 1/2 inch cubes and place in a microwave safe bowl and toss potatoes with 1 tablespoon oil. Cover and microwave for 6-7 minutes. Halfway through cooking, shake bowl to redistribute the potatoes. Heat 1 tablespoon of oil in large skillet over medium heat. Add the chorizo to the skillet, break up into bite-sized pieces, and render the fat from the chorizo for about 10 minutes. Remove chorizo from the pan leaving the fat in the skillet. Heat large skillet to medium-high heat. Add diced onions and jalapenos and cook until onions become translucent and soft. Add the potatoes and cook potatoes until evenly browned. This process will take about 15 minutes. Note: In this step, I season with a little salt, pepper, and chili powder. This recipe does not require too much salt since chorizo is packed with tons of flavor! 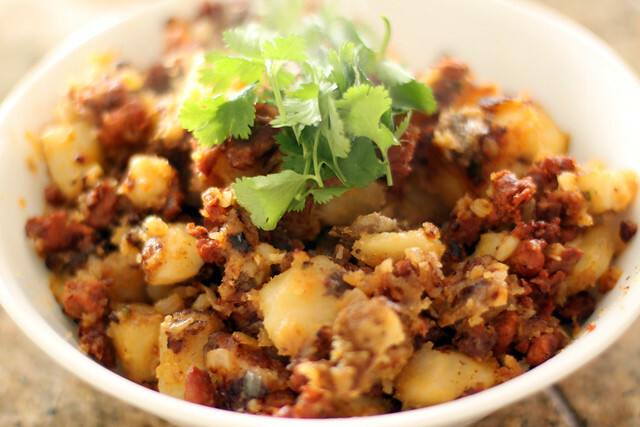 Stir in chorizo into potatoes until potatoes and chorizo mixed together for several minutes. Transfer to a plate and serve with scrambled eggs, beans, pico de gallo, and tortillas or… whatever you feel like eating it with.